Toyota Motor Corporation announced that the Crown Majesta has undergone a complete redesign, and will go on sale from today at Toyota dealers in Japan nationwide today (Tokyo Toyota and Tokyo Toyopet in the Tokyo area and Osaka Toyopet dealers in the Osaka region). 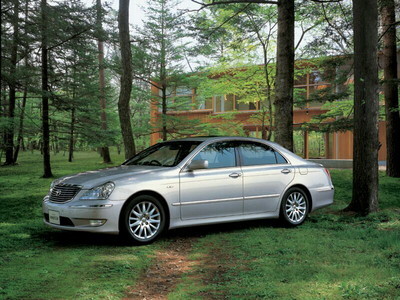 The new Crown Majesta follows in the footsteps of the Crown Royal Series and the Crown Athlete, which underwent complete redesigns last December based on ideas dating back to the very origins of the vehicles, but it was also created to take the top position on the next generation of Toyota brand vehicles in consideration of the domestic launch of the Lexus brand in 2005. With "dynamic and majestic" as its theme, the new Crown Majesta has an imposing presence that is attractive and expresses vitality, and the vehicle features a 4.3-liter engine and VDIM (Vehicle Dynamics Integrated Management) that provides highly responsive driving performance. The adoption of cutting-edge technology, including "Pre-crash Safety" (radar system) that uses a CMOS (Complementary Metal Oxide Semiconductor) camera, and radar cruise control with a low-speed mode that keeps track of the preceding vehicle, enhances its status as a luxury vehicle. The new Crown Majesta expresses the ideal for a prestigious sedan in a new era. The strong form of the front end, the unrestrained side view, and the dynamic and characteristic rear view that tapers toward the rear create a majestic appearance that exhibits attractiveness and dynamism. All models are equipped with a 4.3-liter engine, 6 Super ECT with Sequential Shiftmatic, and a newly developed air suspension, providing ready power as well as excellence in maneuverability in the pursuit of fun driving. Non-4WD (rear-wheel-drive) models also feature VDIM. Through the use of numerous cutting-edge technologiessuch as VDIM, an advanced CMOS-camera-equipped "Pre-crash Safety" radar system, a radar cruise control system with a low-speed mode, Lane-keeping Assist system, Night View, Intelligent AFS, etc.broad progress in terms of safety and comfort has been achieved. All vehicles achieve emission levels 75% lower than 2005 standards under the Ministry of Land, Infrastructure and Transports Approval System for Low-emission Vehicles. 2004-07-06 Please quote Autoindex.org if You use this news article!